Members of the Meigs baseball team pose for a picture after winning the Division II district baseball championship following a 6-3 victory over top-seeded Minford at Bob Wren Stadium on the campus of Ohio University in Athens, Ohio. 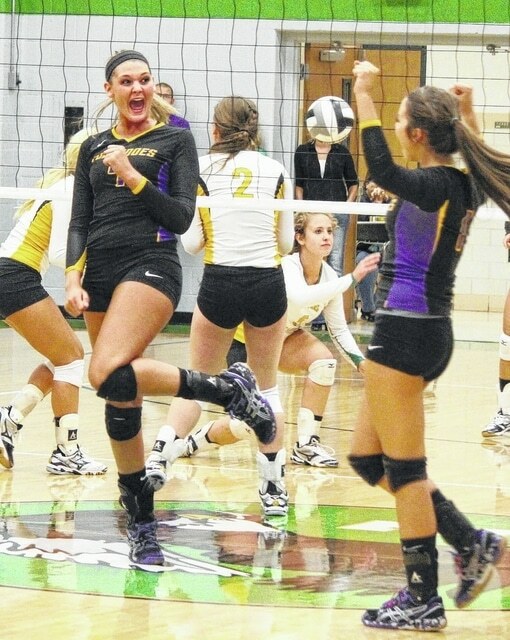 Southern junior Jansen Wolfe, left, celebrates with a teammate after scoring a kill in Game 1 of a TVC Hocking volleyball contest against Eastern in Tuppers Plains, Ohio. You could call it a stroll down memory lane. Then again, you could just as easily say it was making up for lost time. Several sports teams in the Meigs County area traveled deep into each school’s record books during the 2014-15 high school seasons, most of which led to major accomplishments that hadn’t occurred in at least a decade’s worth of time. And some, some were even longer than a mere 10 years. It started in the fall, and it began in a big way during a midseason matchup between Tri-Valley Conference Hocking Division rivals Eastern and Southern. The Lady Tornadoes snapped an 18-match losing skid to host EHS with a 25-9, 25-10, 25-11 victory, their first in volleyball since September 26, 2005. Later that fall, SHS went on to claim their first regular season sweep of the Lady Eagles since the 1996 campaign, then snapped Eastern’s 18-year reign as district qualifiers with a 25-21, 25-15, 25-11 decision in the sectional final. It was also the first time since the 2004 season the Southern volleyball advanced to the district tournament, as well as the first time that Eastern had a losing record in volleyball since the early 1990s. Then there was the Meigs volleyball team, which repeated as sectional champs for the first time in over a decade. In fact, the Lady Marauders ended a 24-year winless drought in the district tournament with a 25-14, 25-20, 19-25, 25-18 victory over Northwest in the semifinals. Meigs eventually fell in straight games to Wheelersburg in the championship match, but the Maroon and Gold advanced to the district final for the first time in program history since 1990. The Southern girls continued their newfound dominance of Eastern at the beginning of basketball season, as the Lady Tornadoes claimed their fourth straight victory over EHS during the school year with a 45-43 decision at home. It was Southern’s first win over the Lady Eagles in hoops since 2003 and also snapped a 21-game losing skid overall. EHS eventually won the second game and picked up the program’s 10th consecutive sectional title, while the Lady Tornadoes haven’t appeared in the district tournament since 2004. Meigs had a double dose of flashbacks during the spring season, with the Lady Marauders softball team and Marauders baseball team providing most of those memories —which included both squads putting together a 10-game winning streak during the season. The Lady Marauders advanced to their first district championship game in softball since the turn of the century, which ultimately ended in a 9-0 loss to Wheelersburg. The Marauders, on the other hand, defeated four consecutive higher seeded teams en route to the program’s fourth district championship — and first since 1996. Meigs also participated in its first regional semifinal in 19 years before dropping a heartbreaking 1-0 decision to Big Walnut in eight innings. Tristen Wolfe became the first Southern boy to eclipse the 1,000-point plateau for his basketball career since 2004, while Eastern football defeated Wahama for the first time since 2001. There were a handful of other timely accomplishments that went on in Gallia County and Mason County this year, but Meigs County was clearly the place to be for a trip back in time.